Plumbers are swamped with calls from homeowners asking for help. While it is true that old homes are more likely to suffer from frozen pipes, it can happen to anyone. The risk of frozen pipes depends on where the pipes are located and their insulation method. Water expands when it freezes, which can result to leaking or bursting of weak pipes. Below are some of the things that you can do when a frozen pipe bursts at your home. It is important that you know where the main water valve is found in case of emergencies, such as the bursting of a frozen pipe. You should shut it off right away. There are instances in which electricity must also be turned off in the area where the pipe has burst. If you live in an apartment complex, and can’t shut off the water supply on your own, then be sure to contact the landlord or building manager immediately. The next step is to contact a plumber. Keep in mind that not all plumbing companies offer 24-hour emergency services. It is recommended that you do your research, and find the contact number of a reliable plumber. That way you don’t just settle for who is available when your frozen pipe has burst. 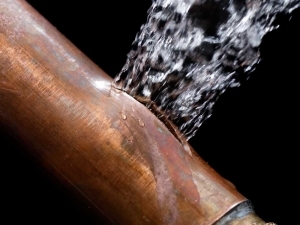 Plumbing costs depend on where the pipes are found, and how bad the damage is. You will also need the help of water damage professional if walls, ceilings, flooring or carpeting are damaged due to the bursting of the frozen pipe. Jenkins Restorations can be reached at any time – by phone at 888.450.6580 or online. It is important to remove water right away to prevent mildew and mold buildup. For this task, you will need towels, buckets, mops, and a wet/dry vacuum. You should not wait for the plumber to remove the water for you. When the weather gets too cold, you should let water drip from your faucet. While the dripping might be irritating to some, this will help prevent water from freezing. You can detect a frozen pipe if the faucet stops to run, or if the toilet doesn’t refill. If you suspect that there’s a frozen pipe, try thawing it yourself before it bursts. You can use a heating pad, warm washcloth, hair dryer or a space heater. Or call a plumber as soon as possible to handle it. These are the things that you need to do when a frozen pipe bursts. There’s no need to panic when it happens at your home or apartment. Just make sure you have the contact details of a reliable plumber or water damage professional like Jenkins Restorations ready for emergency situations such as this.